Battle. Red-figure kyathos from Vulci. In the first half of the 5th century B.C. 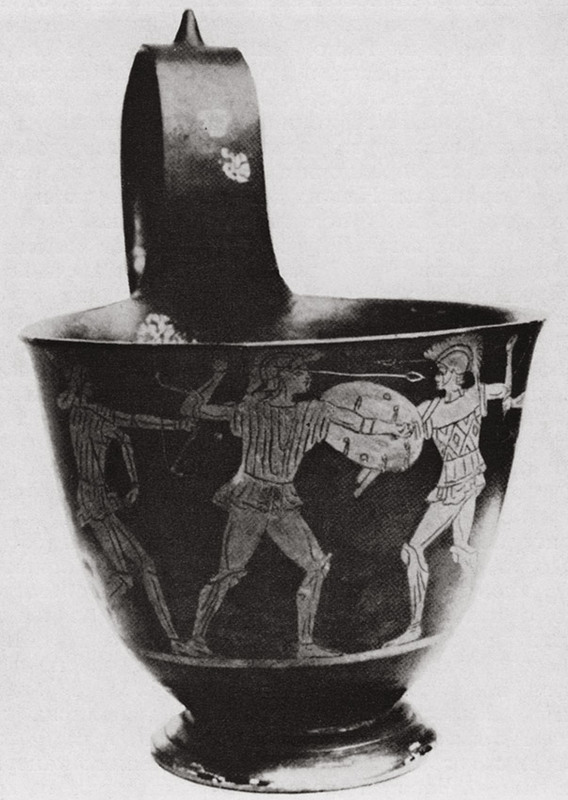 Etruscan potters used particular technique; figures with scratched details were drawn with red lacquer on the surface of the vessel already covered with black lacquer. On the kyathos from Vulci painted in this manner two adversaries closed by shields have taken spears up, and archers are shooting arrows behind their backs. © Photo, text: G. I. Sokolov. Iskusstvo etruskov. M., Izd-vo “Iskusstvo”, 1990, s. 207, il. 120.